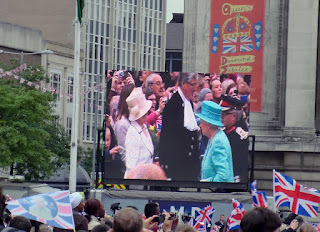 Nottingham received a royal visit today (Wednesday). 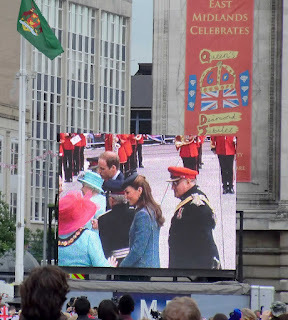 Her Majesty the Queen, accompanied by their Royal Highnesses the Duke and Duchess of Cambridge, travelled by car from Nottingham railway station to the Old Market Square to be greeted by thousands of cheering and flag waving people, of all ages. I'd arrived at 9.30 and the main part of the square was already filled- the front row had been there since about 6 o'clock. So I found a spot at the rail behind the water feature (almost at the far end of the square) but I had a reasonable view of the balcony of the Council House- and my OH's camera with a reasonable zoom on it. 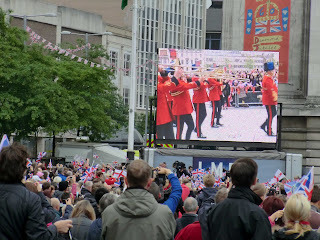 It was quite fun watching the poor bloke on the roof getting the royal standard ready to raise- he took his jacket off before he started, so it must have been warmer up there than at ground level! There was a band of musicians, but we couldn't really hear them at the back. tops of hats and the cars. They did a brief walkabout saying hello to those at the front, and accepting lots of flowers. The Queen was wearing a matching hat and coat, apparently it was green, but it looked more blue from a distance. But amid the crowds and officials she certainly stood out. There was a big cheer when the Duke and Duchess of Cambridge were seen. 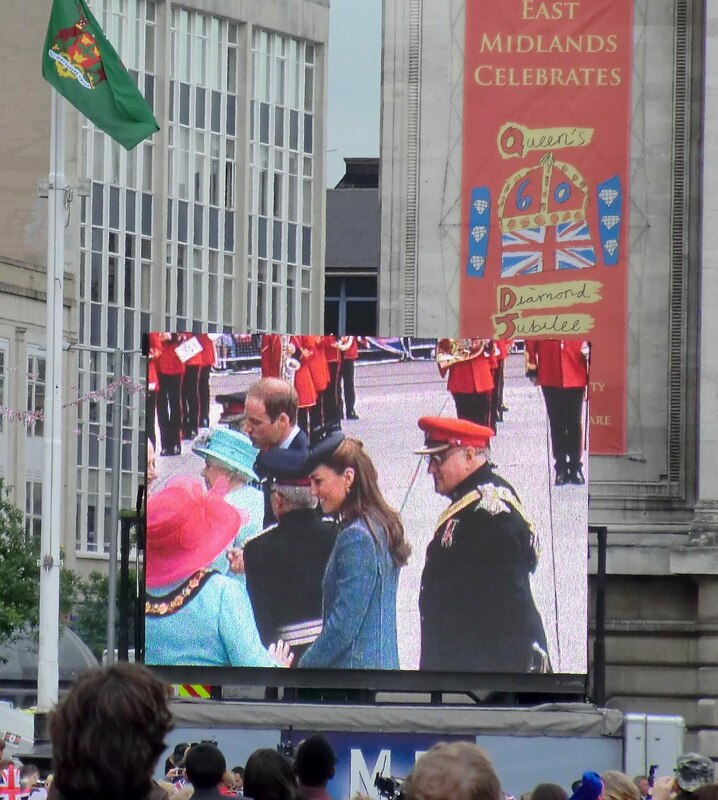 Ev erytime they appeared on the screen one or other of the numerous people escorting them, unaware of the camera man, would get in the way, and you could only see the back of the Duke's head- he has a bald patch, or the Duchess's brown hair with the little blue hat perched atop her head. 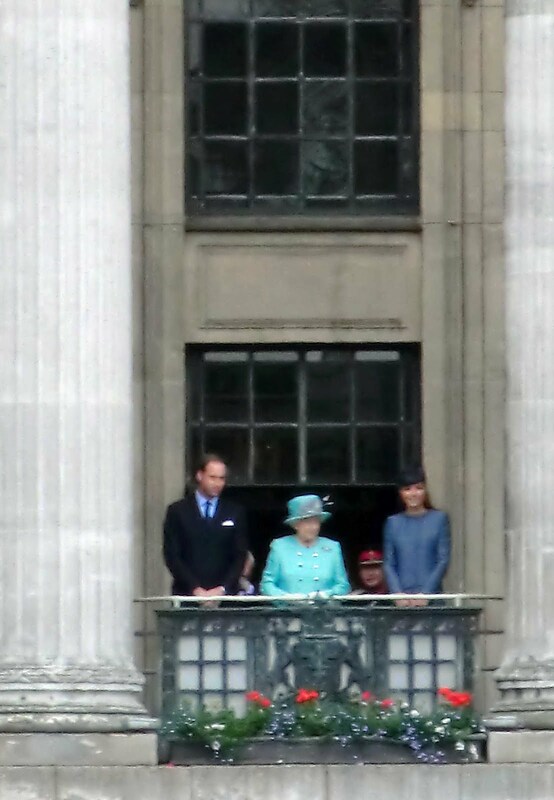 Everything settled down when the royal guests went into the Council House, but everyone was waiting for the balcony appearance. And when they stepped out there was a roar, cheering, waving of flags, and hand waving. At the back we couldn't hear the music for the National Anthem, so we couldn't join in, but those at the front did. The Queen smiled a lot, and after another wave they went back inside, into the Ballroom. 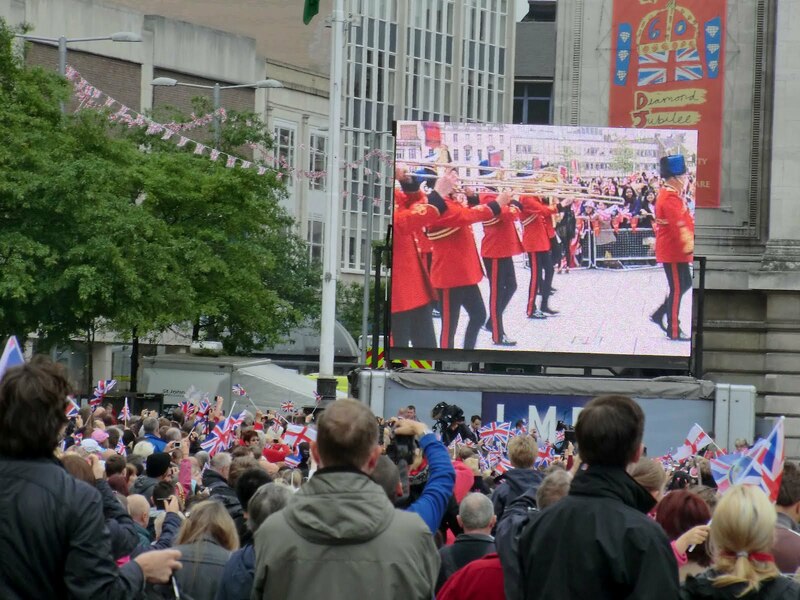 Some of the crowd left then, but the majority waited about another twenty minutes until they came out to get in the car to go to their next engagement in Basford. Then the crowds casually dispersed in all directions, some to shop or go on to work, others to take their children back to school, or like me to go home. Carol, that's lovely. Isn't wonderful to be a part of history? I'm not going to see anything like this again, so it was worth every minute. Sounds great! It's nice to see the royal family get so much support. Just a shame that Phillip is still not 100% well. Sounds like you had a great day! Made me feel all nostalgic as I come from your part of the world but now live in Lanzarote! It was wonderful to see so many people of all ages from babies in pushchairs, to those around the same age as the Queen. It was a shame the Duke of Edinburgh wasn't able to attend, Sally. It is one of those events that the UK does so distinctly. How lovely to be part of some of the celebrations, Carol. Thanks for the photos! It was wonderful to see so many people gathered in one place and to take part in a once in a lifetime event, Rosemary.